BLOG | The Seven Songs | "an epic in the making"
I’m really glad that the importance of the hero’s journey has shone through for this reviewer. In the book, Gentil truly has to travel into the unknown and face new dimensions within himself as well as in the world around, and therein lies the heroic journey. For the same reason I wanted to include the “voyage” in the book title, and again the same reviewer notes that the boat herself “is at the centre of a mythic quest” in which all on board participate. All are in flight, but at the same time in search of a kind of redemption. Itxaso’s mission binds them all on the physical journey, but for each one an inner quest mirrors the outer. The quest gives meaning to life. I am reminded here of Viktor Frankl’s renowned work in Vienna with suicidally inclined youngsters, where his therapy consisted in helping them to find a meaning and purpose for their life. We know that suicide is alarmingly common in young people in our own time, in the US being the second leading cause of death in youngsters from age 15-24. It should be said here that my “seven songs” are all meant as songs of life and meaningfulness.This is the connection that all of King Abba’s children have to make with reality, each in their own way. I have just released The Voyage of the Kresala, the latest title in my Seven Songs fantasy series, where we start to see more clearly the great divisions taking place across the European continent. The conflict, of course, arises from the question of the moment, currently affecting several countries and it boils down to this: Which do we want? The megastate Europus, uniformly bent to (for want of a word) Germanic aims and standards? Or the beauteous Europa with her myriad and varied delights that Zeus himself could not resist, and so carried off to Crete on his bull-like shoulders? When I put it like that, I suppose it’s fairly clear which of the two I would rather see. It’s also fairly clear which of the two is preferred by Syriza’s Yanis Varoufakis, the “erratic” Marxist now heading the finance ministry in Athens. For him, the question is not simply one between head and heart, as some might suppose. Varoufakis sees as inevitable that the Europus he dislikes so much, born out of neoliberal economics and politics, will fall apart with the demise of capitalism that Marx predicted. As he says confidently, it carries within it the seeds of its own destruction. We have a reasonable idea of what Europus represents. Rigour, uniformity, discipline, good housekeeping (to evoke Madame Thatcher) and so on. All that Kafka warned us against, in vain? Equally George Orwell in 1984, a scary vision, in many aspects already a reality: people at the service of the machine, too frightened to be different, and controlled or monitored in their very thoughts. What perhaps we hadn’t realised as we created Europus is that people were dispensable in this great work. As the juggernaut trundled through our once independent little nations, changing all the road signs as it went, people were shovelled to the wayside like snowfall on a motorway. This human wreckage, fruit of austerity, was the “price to be paid.” Not by the bankers, not by the politicians, nor by those with their noses in the trough in Brussels and Strasbourg. No, a price paid by the young, the small traders, the elderly and the vulnerable. Civic values, democratic values, social values, all these were waved aside as the economically correct troika imposed its will on one nation after another, in the process setting up governments that simply toed the line and were given no option to do otherwise. In other words, not representative of their nation’s peoples at all. Can we say what Europa herself stands for, by way of contrast? Diversity, imagination, creativity, art, elegance, versatility …? And adding to those the relational values of trust and mutual self-awareness, perhaps that offers us a mix that we see in imitation of nature itself. Such a blend would be characteristic of sustainability, the most vital quality that we should be aiming for given the state of the modern world. Perhaps we can throw light on the difference between Europus and Europa if we think in terms of Henri Bortoft’s authentic and counterfeit wholes. Europus in this schema would be a counterfeit whole par excellence, a monolith to which its parts are in service and even servitude. For, let us be clear, we are only parts in this construction, and therefore are truly dispensable. Just as the giant corporation turns thousands on to the street in its juggling of the books, so Europus’ first instinct is to do the same. The bottom line is made up of numbers, not of human lives. Europa, though, may be considered as an authentic whole. I do not daydream about perfection here, but it is very noticeable how deeply the values in southern, Mediterranean cultures hold society together at the daily level of life where it really matters. Leaving aside the long history of conflict between powers, there is an underlying social fabric that goes back hundreds of years, and now we find a growing sense in these countries that something precious and meaningful in its own right has been violated. Just as Islamic militants shatter ancient artefacts that are meaningless, even offensive, to them, so also the juggernaut Europus wields the hammer against all that offends economic probity. Well, yes, in some cultures perhaps there has been a lack of care for the morrow, in the interests of living today to the full. Yes, we acknowledge there, too, the hidden workings of those family knots and networks that cut corners in the interests of getting results. And those inexcusably long lunches before getting around to the real business on the agenda … Time wasted? Who is to say? Perhaps this is a more valid way of establishing working relations and outcome, as opposed to alcohol-free profit-making purely for its own sake. What emerges from Europa’s way of doing things is a continually self-refreshing dynamic, often full of surprises, that actually makes “government” at times irrelevant and certainly of less importance. This is freedom, but for a purpose. The future will manifest these battle lines more and more, I predict, as our century progresses. The smaller political parties that favour Europa are already marshalling support and will grow in strength and number. Their social mission is becoming clearer and clearer. As mentioned in the opening, I present an imagined future for these developments in my fantasy series, The Seven Songs, where the battle is already over as we enter the first book of the cycle, King Abba. We are in 2034 and Europus is in hegemony. Those faithful to Europa have been swept aside in a merciless suppression and are reduced to handfuls of dissidents scattered in places of relative safety. But the monolith must fall through its own internal weakness and all is up for grabs again. Can the freedom fighters unite and regain the initiative? Will deposed King Abba’s children be able to turn the clock back and restore the beauty of Europa? I watch with interest as events in the real world unfurl, bringing about huge social changes which King Abba himself has foreseen, and in which he will play his part, too, for the eventual salvation that we and Mr Varoufakis all devoutly pray for. The latest title in The Seven Songs series, The Voyage of the Kresala was released in February. The cycle of The Seven Songs moves on to telling Gentil’s story in this new title in the series, The Voyage of the Kresala. On escaping from the destruction of the royal palace (see King Abba), he and his friend Alick had an urge to travel and find adventure, and, my goodness, they certainly encounter it on this epic journey sailing across the Northern Ocean to the distant Winter Isles. Gentil is the younger brother of Fion, and a very different character. As he himself confesses, he never learned much in class, and was bored in lessons most of the time. But his real learning centre is to be the school of life, and in this adventure story, from the very first page of the book, he is pitched headlong into what you could literally call “hands-on” learning, as the yacht Kresala is hit by an almighty storm. This scene has a special significance for me, as it describes almost exactly what happened to me on a sailing trip across the Atlantic. I was the one wrestling with the helm as the others tried to restore order in a tangle of spars and breakage. it was an unforgettable experience and I hope I have captured the event when it happens to Gentil, too. From this point, Gentil doesn’t look back, and is very soon involved in another way with the mysterious “cargo” that Nestor, the skipper, has brought aboard quietly one night. Who is Itxaso and what is the secret mission that takes them all nearer and nearer to danger? Gentil’s journey across the ocean will change him for life. Join him on his great voyage of discovery. The fourfold arises everywhere we look, both in classical and in modern thought. The tetraktys, the four elements, the four humours, William Blake’s Zoas, Jung’s pattern of basic psychological types, Martin Heidegger’s fourfold “thing”. I find especially intriguing Heidegger’s exploration of the fourfold. Here as elsewhere, he offers a challenge to our customary way of viewing the world, a challenge addressed to science and rationalism as much as to our own habits of thought. In order to make us think and “see” in ways that our received language has not developed to express, he breaks the boundaries of grammar. Nouns, parts of speech that we associate with defined and limited meanings, he turns to active verbs, such that presence becomes “presencing”, world becomes “worlding”, thing becomes “thinging”. When the world is “worlding”, as he puts it, that is, becoming truly present to us, it cannot be explained. And part of this worlding is when a “thing” becomes truly present to us in all its four dimensions. In a fine and suddenly evocative passage in The Thing (trans. 1971) he describes this arising of a thing as it “things” to us (lisping pun not intended …!). Thinging, the thing stays the united four, earth and sky, divinities and mortals, in the simple onefold of their self-unified fourfold. The divinities are the beckoning messengers of the godhead. I enjoy this passage for Albert Hofstader’s elegant translation, and also because it shows that Heidegger for all his nitpicking reasoning, or undoing of reasoning, is aiming for something higher and beyond reason, something that belongs to the domain of poetry and imaginal vision. He goes on to explore further the unity of the four. This fourfold of the “thing” in its fullest being is a “gathering”, he says, reminding us of the Old German etymology of “thing” as a meeting or coming together for a purpose. Note that in Wildern the community gathers at the Meet-Thing to discuss matters of common interest, and herein lies the deeper meaning of thing as a “matter”. Addressing a matter is a process, not a predefined outcome, and similarly things that gather the fourfold into a single unity engage us in a way that encompasses simultaneously all the possible dimensions without predefinition. To return to the foursome tree, the tree “things” because it engages us on all four levels, just as Heidegger proposes in regard to a chalice. Earth and sky, divinities and mortals are all gathered in the presencing or thinging of the tree. And seeing the tree in this light is just what Prince Fion is experiencing as he has a sudden insight into the “book of Nature” and realises the difference between “knowledge” and “knowing.” Knowledge seeks to explain, while knowing waits for clarity of vision. Here something akin to a mystical process is at work. Thus Fion’s search for understanding takes a great leap forward. Poetry, Language, Thought. Trans. Albert Hofstader 1971. From Single vision & Newtons sleep. William Blake scornfully dismissed bleak rationalism, what he terms here as “single vision” and “Newton’s sleep”, as a way of perceiving and understanding the world we live in. True understanding did not lie that way, he maintained, but in exercising the Imagination and “seeing” in a visionary sense beyond the immediate sense impressions. In describing the foursome tree as a symbol of perfection, Margaret is drawing on a tradition that, as noted in the previous post (The foursome tree) arises from number symbolism in classical thought and subsequently appears in many forms and interpretations down the centuries. So in opening up to Blake’s fourfold vision we find ourselves able to perceive the universe in its infinite perfection. It is a vision in which we do not stand as observers but as participating co-creators. We are in the universe as much as the universe is in us. In the last century, the phenomologist Martin Heidegger also framed a response to the notion that science could ultimately “explain everything”. Like Blake, he saw science as having a limited field of perception, working, as he saw it, with “objects” rather than “things.” When we work with objects, he argued, we do not see beyond our own need to call for explanations, and that way falls short of transcending the true nature of the world. By trying to understand what Heidegger means by a “thing”, we enter into a completely different realm of perception and understanding. The two of them were towards the front of the procession and among the first to arrive at the foursome tree, where the hawthorn was now in bloom with tiny white flowers. Fion went straight up to look at the tree with curiosity, seeing the branches of the four elements mingled together. It was miraculous to see how the hawthorn stem, the ivy and the holly grew directly out of the rock, twisting together as they fought their way into the freedom of the air. The mistletoe hung from the higher branches of the tree, making up the four – the sign of completeness, as Margaret had said. Her words made him think that nature itself may be like a book which can be read, if you know how. Each living thing had a meaning to tell you, and you couldn’t arrive at it simply through reasoning. This was where her approach to knowledge differed so radically from what Fion had always been taught in science classes. Her way seemed to be about “knowing” rather than “knowledge”. And what was the difference? He had much to learn from her yet, he reflected. Or, perhaps to be more precise, much to learn from the tree? The foursome tree really exists, in a mountain area of southern Europe. It is a remarkable sight, displaying exactly what Fion sees in the book. The roots of the hawthorn, holly and ivy grow from the solid rock and the mistletoe hangs in the upper branches where all four are entangled. Cattle and horses graze in the wide grasslands all around, and a chain of snowy peaks extends along the southern horizon. This open area is the Ras, as the book names it, for the summer grazing of livestock. The significance of the four is built into the ancient Pythagorean symbol of the tetraktys, the triangular arrangement of the building blocks of creation, shown here. These can be visualised as the digits 1 through to 0, from which an infinity of numbers can be obtained. While on the one hand representative of the ascent of the human spirit towards the One, the configuration also shows the pattern of descent from undivided spirit into the unfolding of matter, space and time. 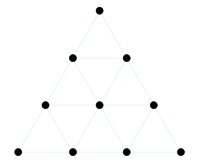 The One first divides, then extends, and finally has the potential to open out into three-dimensional structures such as the pyramid and the cube. Arising out of these forms and relationships come the elements of harmonics and proportion, so that wherever we find resonance and meaning can be traced back to these fundamentals. Nature is indeed a book that can be read, as Fion discovers, through “knowing” rather than through “knowledge”. There’s a scene in Chapter 2 where Behind the Mountain really began for me, some years ago. I had gone to the Pyrenees for a month to do some writing and I remember standing on a bridge in a peaceful valley, watching the house martins fly up and down the mountain stream. I was completely engaged with the peace and beauty of the valley, and maybe even saw it as a kind of refuge from millennial madness, the threat of which around then was still in vogue. I don’t know that millennial madness has gone away. If anything it appears more and more threatening as we watch our absurd politicians and governments squabbling beside the rising waters. Not that long ago, it seemed that half of southern England was under water. The sea which for centuries lapped at the foot of Glastonbury Tor (how else could Joseph of Arimathea have sailed there…?) is now reclaiming its own. How did we let things get so bad? Surely through sheer stupidity and short-term gain, along with wilful ignorance of nature. Shouldn’t we tear up the “developed society” blueprint and start again? That is really the message of The Seven Songs. So Chapter 2 is where we find Princess Dream in the valley of Wildern, closely observing the martins as they skim the rippling stream. She is the character who can’t see nature without wanting to take out her sketchbook and paintbox. She is not skilful with words, at least not in the beginning, but she grows in strength as her character develops, and takes a quite unexpected and adventurous path in this book. Prince Fion has also forced surprises on me. At one point I had a real struggle with him and, in paratrooper terms, almost had to shove him out of the plane so he would get back on his hero’s journey. He is assailed by doubts and also, poor lad, thinks he has problems with relationships. Who doesn’t? Especially at age fifteen. It’s quite a difficulty when your character won’t do what you had planned for them and in this regard Fion has perhaps been the most problematic. However, an awful lot is being asked of him, to save the world amongst other things, so we have to be patient with him. His greatest tests are to follow, as his mentor Adhemar tells him. We shall see as the series develops. I’ve been very fortunate in my years as editor to work with exceptional and bright people dedicated to refashioning ideas in science and philosophy. We’re going through a time of enormous change in western culture, and the old paradigms no longer stand the test of time. Many of our accepted practices and beliefs have brought us, and our planet, to a place of extreme vulnerability and dire ugliness. Tragically, we have too long disregarded the damage we’ve been causing, and those voices that called out for change were simply ignored. Governments and institutions that should have been protectors of society and landscape, have played into the hands of commerce and short-term profiteering. It was against this background that I started to write King Abba, a philosophical fantasy for young people, equally for any thoughtful person unhappy with current values and practices in education, science, technology, economics and government. My aim was to open up questions which are not often asked in our educational system, and introduce doubts and queries where we take so much for granted as if there were no other way of seeing things. As much of what we accept is actually absurd, there is a comic element in the book, too. It can be seen as a satire of our times and our present world. The book is written as an adventure story, but stops now and then to ask questions. Now Behind the Mountain takes the story further as we discover what happens to Fion and Dream after the breakdown of the system. More questions, this time of a more immediate nature, but just as important. Here we enter the realm of survival … And the meaning of values and relationship. Those who have read King Abba, the first book of The Seven Songs, will recall that it portrays in the not too distant future a United States of Europus governed by a single party founded on unassailable principles of science and reason. Who could question such a benevolent order? It would represent the fruition and triumph of the Enlightenment dream. As Alex Proud wrote nostalgically in a recent Telegraph article, many people have long pinned their vision of a secular rational society on such a premise: “There was a widespread, unspoken belief that science could and would solve all our problems.” (04/03/2014) Why not then combine science, reason and politics in a perfect marriage as King Abba describes? Yet there was always a catch in this vision of a rational Utopia. It was doomed to fail for one simple reason: it was founded on the wrong science. Alex Proud goes on to lament that “ these days it feels a bit like the Enlightenment has gone into reverse”. But if so, surely this is because we have come to treat the light of reason as a utility, rather like the light in a fridge door. We turn it on when it serves us and ignore it when it doesn’t. There is only on/off. There is no “whole dynamic picture” guiding a process to some creative end. The light doesn’t illuminate any meaningful path. So at the end of King Abba, the Utopian high-tech order collapses, fatally flawed, unable to sustain its own technically brilliant but pointless wizardry. The King has disappeared, leaving all in chaos, some wise souls assuring that this is precisely what he wants. Now, it seems, we must all pass through the edge of chaos and ride the wave of transition. Different groups will make their own paths through this chaotic change and seek out new forms of stability. Behind the Mountain picks up from here. Two of the royal youngsters are rescued from the final cataclysm by the wise woman Margaret. She leads them to safety in the mountains to join the Bellsingers, an alternative community dedicated to living in peace and harmony with nature and in consensus with one another. The belief system here is as fierce as the secular mentality of the Rationalists, who despise and persecute the Bellsingers for their so-called “medieval” errors and superstitions. Where comes the storyteller in all this? Well, culturally stories are the history, and perhaps more importantly, the future of a society. They have prophetic power. Stories tell not only of the choices that we have, but also the consequences of making them. Significantly, too, all storytellers know from their experience that they don’t tell the stories. The stories are told to them. The warnings come from elsewhere. Here we participate in a great mystery. But now the curtain is rising, The Seven Songs are tuning up, and my youngsters invite you to join them on their individual hero journeys. Where will they lead? I hope you enjoy the read. Thanks for your interest and support. My thanks to Philip Franses too for his generous review on the same website.